The big difference today is there aren't really any major developments on the near-term horizon to fuel a fresh wave of new economic growth, such as those provided by the Internet, computing and telecoms revolutions of the last 20 years. This time, the name-of-the-game is to optimize the tools we have, and be smarter than our competitors. Eventually, we'll see real progress being made in areas such as medical research, Cloud computing and Green tech that should fuel a new growth era, but it's not going to be upon us quite just yet. In today's global economy, the options available to provide products and services leveraging global talent and new technologies, are almost suffocating for most firms. There's never been a time more crucial than now to find the right partners who can help you source global talent effectively. Cost-reduction dominates, but only where there is significant scale to exploit labor arbitrage opportunities. While the mid-large customers (90%) overwhelmingly look at cost-reduction as their prime driver, smaller firms do not have the same scale to enjoy such immediate cost take-out potential, with only 60% citing reducing costs as a primary driver. They actually regard accessing new process acumen, technical skills and having support to operate more effectively at a global level, as similarly powerful motives. Empowering global operations and re-engineering processes are coming to the fore. When we ran a similar study six months' ago, it was already becoming clear that customers, when looking at outsourcing, are anticipating more business benefits than merely driving our some initial cost. 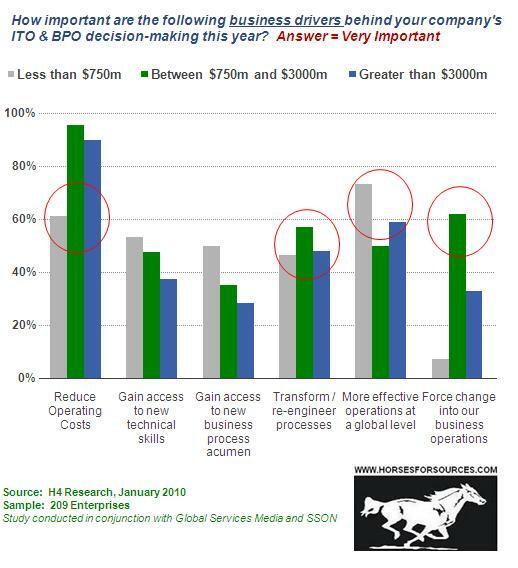 As we emerge from the recession, their desire to leverage global sourcing to help them operate more effectively as a global organization and re-wire their operations to support that process, is becoming even more apparent, with over half of all customers citing the need to globalize and transform processes as prime outsourcing motives. And this is across all size-classes of customer. The need to globalize is impacting all companies, and outsourcing is providing one vehicle firms are looking at to help them achieve it. The mid-market increasingly views outsourcing as a vehicle to force change into their business operations. As we've discussed exhaustively during the downturn, many businesses are struggling to break out of the old way of running operations, and outsourcing is increasingly being viewed as a major change-agent, with close to two-thirds of mid-sized customers citing this as a very important driver for outsourcing this year. While mid-market customers clearly feel the need to combat fatigue from old business support models, large firms are less inclined to view outsourcing this way, as they are more used to using customized sourcing approaches and captive / shared services models, that are harder to "change" solely with outsourcing engagements. Small firms tend to use outsourcing moreto augment the value it brings from an added resource, talent and global standpoint, but because of the lack of scale will struggle to force real change into the business models with limited labor arbitrage opportunity. There's much more to follow from this study in the coming days, but we can already conclude that this unique view across the real drivers behind outsourcing clearly compliments the profound and fundamental changes we are going through across most industry sectors. 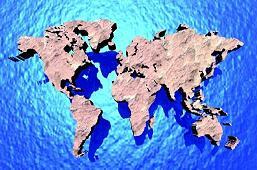 Global business is rapidly changing, and outsourcing provides a vehicle for many business to change with it. Love to hear your thoughts / comments. You can also email me at phil dot fersht at horsesforsources dot com. Outsourcing is not only about cost, but it is rarely viable unless there are cost savings. If the motivation behind outsourcing is to force change into business operations, cost is almost always utilized as a key metric. In my experience, intelligent outsourcing (not just offshoring, but even domestic outsourcing) can provide a strategically oriented company with the nimbleness and flexibility that can never be acheived by staying completely in-house. An effective outsourcing strategy involves more than just cost reductions - it targets the accessing of expertise and capabilities that are either beyond the reach of the company, or more affordable than developing those capabilities in-house. In addition, for some companies, outsourcing provides an opportunity to secure third party or objective perspectives on particular business issues, and forces a company out of the "not-invented-here" sydnrome that can effectively burden a company with the weight of limited in-house expertise and lack of vision. Outsourcing has become a hot-button term, but in fact, every single company in some way, shape, or form does in fact outsource, whether it is IT expertise, legal advice, or manufacturing. IF the outsourcing label hinders a company or management from pursuing an otherwise credible strategy, the company is doomed to shortly find itself atop the scrap heap of slow, inflexible, and ultimately stubborn-to-the-end firms who couldn't match their competitors in the global marketplace and were relegated to oblivion. I think that this is a very pertinent issue given the current business climate. With business being strained to increase sales and growth and the need to restructure teams to make them more productive it is inevitable that consideration will be given to introducing change catalysts into the business. However, the ability to finance change programmes will be a consideration for the business whether it is large or small. In such circumstances businesses are often prepared to take "a risk of failure" in order to reduce costs. This is invariably done without analysing or recognising the potential additional costs should the change programme not be successful and without taking account of the high failure rate amongst resructured teams. Phil - I echo Andrew's comments as we are looking forward to more data from this report, but a couple of comments on these results. Our clients have revenue well in excess of $3B, and while the cost reduction theme is strong, the demand for flexibility prevails. Many of them see their greatest opportunities for growth overseas and are trying to manage those investments while balancing contraction in traditional, local markets. I also think it is interesting that the smallest companies place so much emphasis on global operations as companies in this size range are often local/regional businesses. Is this a signal of an offshore wave to come among smaller companies? 'Cost only' is a very 1-dimensional way of looking at a business question. A short term (cost) gain may (sometimes after years) lead to a long term loss. A recent example is that of high quality sportswear suppliers losing marketshare to Chinese suppliers they originally outsourced to. There is a difference between outsourcing and partnering for instance. And there is a difference between outsourcing to a supplier that can become a competitor. Companies and organizations should stick to their knitting. In other words define what their mission is and focus on the skills and resources to be in the top tier of developing and delivering those products or services. All other functions are fair game for outsourcing - best possible services at balanced with the lowest reasonable cost for that service. Change agent comes in as a matter of focus e.g. what a company or organization is really about. The mission focus. 1- Matching the Market Size and penetration data to the respondents size stratification should prove interesting, if available. i suspect that the Mid-Size firms ($750M - $3B) form the greatest opportunity segment for potential Outsourcing decision. 2- The first comment referred to the root company's inability to break through the divisional barriers without using Outsourcing. I call this (inappropriately, I'm sure) the "cojones factor". If a company doesn't have the determination to make significant process and operational changes without going to an outsourcer, then they are likely missing other opportunities as well. 3- There will be continuing pressure on off-shoring from the US, especially in today's atmosphere of 10%+ local unemployment. I'm curious to see if other companies are following Dow's Midland, MI experience wherein (check my info) they have outsourced, but with the stipulation the outsourcer hire their people and set up locally. This may sound like a significantly higher cost option, but then again maybe not. If the outsourcer can drive producivity through process redesign, etc then they can add in work from other firms in unrelated industries to provide a growing payback for all concerned. 4- There is a need for both labor arbitrage and "value-add" offerings. The latter is the only way for sustainable business growth, unless you are the low-cost leader willing to follow-the-sun on labor rates. There is an open avenue, however, for improved value add, if you work from the inside. That is, apply the "intimate contextual knowledge" from within a company to provide much more than operating cost savings. This is a vote for "captives", but the savings can be achieved as well by an outsourcer with the right attitude/goals and retained operations. I'm attaching an article in SSON where I discuss the power of business-based savings along with the leverage of improved Customer Satisfaction levels. That's My Two Cent,s and thanks for the opportunity to comment. At the end of the day cost is a factor, however, the prime benefits I have gotten from outsourcing (in my case to India) has been flexibility and the extra skill sets to expand my own reach. Having served Outsourcing companies for a long time in my career it’s definitely never been about cost. Back in the 90s the concept itself need to be explained and marketed to Foreign companies. By the beginning of 2000, clients were very clear on their expectations and measurement compliances which meant they knew what they were getting into. Going forward, in the coming years I see outsourcing companies trying to be more specialized in their services by focusing their client base within specific industries only. This would clearly mean apart from the quality aspect client companies would start receiving focused guidance and opinions from another prospective, which will lead to more innovative products and services in the market. When I see a company that wants to outsource because their priority is to save, I also see a fail relationship and a fail strategy. Sure, cost savings is the easiest way to justify a relationship with an outsourcing vendor, but it is not the best decision trigger. Cost savings, not exactly in the dollars you will pay but in what you will get and how that contribute to your company strategy. Access to talent and diversity is not easy to justify and it is case by case. Either there is a lack of awareness in companies to invest time in this not easy to justify reasons and the outsourcing vendor to propose along these lines. Sure companies want to save costs, but we have seen that focusing in customer service, improve your offering is more efective. Just look back at companies that were successful last year. There is no either/or in this equation. To force operational change (outsourcing or otherwise) without a measurable benefit as an outcome just doesn't make sense. Process transformations such as outsourcing carry significant costs in terms of capital and time. Under no circumstances should anyone decide upon outsourcing before undertaking a thorough assessment of the current state of the business process in question. That analysis should clearly define the problems or defects you seek to eliminate and then identify the root cause of the problem. Only at that point do you decide which is the right approach to solving the problem. The fact is, outsourcing is just one of a number of possible solutions to improving process efficiency and margins. The others include consolidation, elimination, automation and standardization. The application of process quality methodologies such as Lean and Six Sigma would produce the kind of evaluation to which I'm referring. The foundation for those process improvement methodologies is a solid business case that defines the underlying cost of the current state of the process, the implementation costs of the proposed solution and quantifies the benefits of the solution to offset those costs. So, if you execute your analysis correctly and decide that outsourcing is the right solution, by definition the exercise should not only improve your process quality, but also yield quantifiable benefits in terms of reduced costs, improved top line, and/or customer satisfaction. Flexibility, Time zone management, increased productivity, re centering on value add, increased quality, innovation, reduced head count and overheads, less HR, less office space, de-duplication of positions ac cross organizations AND COST. These are all reasons (there are many more), doing it well to get good value is another question! outsourcing brings about organization change whether you want it or not. so if companies are now explicitly citing it as a driver to outsourcing they have merely woken up to smell the coffee. on this again, i am always bemused when i read comments that outsourcing is not about cost. outsourcing IS about costs. no organization will engage in outsourcing if there isnt a cost benefit. the difference in philosophy over the years is that cost in outsourcing has become hygiene. you go into a restaurant and expect to find clean table linen. you do not go into a restaurant for clean table linen. @yadu: agree cost scnearios are essential for many mid-to-large scale organizations, however, many firms simply do not have technical skills to support new ERP rollouts or technical upgrades. For example, if you swap out, say, QAD for Oracle, how can you retrain all your QAD developpers to program in Oracle and support it? Answer is, you can't - it's either impossible, would take far too long and would cost a fortune to do effectively. Hence, you need to find external support, and an outsourcing transition is the most likely scenario to do it, where you are replacing legacy skills with new skills. Outsourcing is all about cost at the sacrafice of quality, which costs even more in the long run to make up for. I'm now taking a dim, very cynical view on anyone who claims that outsourcing is a good thing to emerging economies. Phil: Outsourcing is viable and strategic when the cost of buying a capability is less than developing it in house. But that cost is not in immediate dollars. You have to think about what makes your business successful, it's secret sauce. And if that sauce can be poached, you are in for a world of hurt. Witness the Chinese automakers leveraging know how they gleaned from years with working with American and European manufacturers. Witness the "4th shift" knock offs. Outsourcing can be wonderful, freeing up valuable resources to focus on your success. Just be careful that short term success doesn't turn into long term failure. I agree with Robert Barrimond. Any company that considers outsourcing, should carefully analyze what their core and non-core activities are. The one big advantage of outsourcing is that your non-core activities become your provider's core activities. Which is why outsourcing should lead to quality and price improvements. As an outsourcing/nearshore provider country in manufacturing, IT, customer support, we get asked this many times. Cost IS important of course, but it SHOULD not be the only reason to Outsource your non-core business functions. Will outsourcing help me do my core business functions (sales, branding, distribution or whatever they are) better and allow me to focus more time and attention on them? Will outsourcing help me acquire more international experience/markets/better suppliers faster than doing it "in house"? Will it increase my company's competitiveness on sales and profit, and not only in costs?